The fantastic walled city of Assisi is famed as the birthplace of St. Francis. I spent two days experiencing the beautiful culture in the city and exploring the many relics of the dark ages. 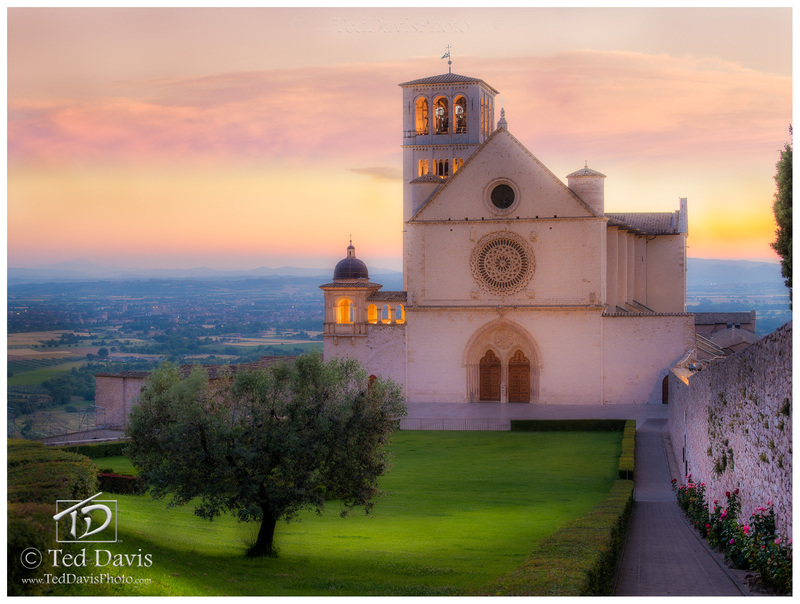 As my time in Assisi drew to a close, I found myself perched at the corner of the Monastery complex with the sun descending quickly towards the horizon. As I gazed at the upper Basilica of St Francis, the sunset took on a soft and mysterious glow – perfectly framing the bell tower and Basilica. With the beautiful scene unfolding before my eye it was the easiest thing for me to simply snap the shutter down, capturing a pure moment in time. Photo © copyright by Ted Davis.